We started our 2018 beautifully. The three Didis (the house leaders) woke up much earlier than the sun to make sure that everything would be perfect before the children came.In fact, they meditated for two hours before the children joined in for another hour. Everyone else rose with the morning sun; the staff, the volunteers, … Continue reading "A New Beginning"
Last night, starting at around 7:00PM (19:00), everyone at Baan Unrak walked down to the outdoor auditorium as the last purples of the evening faded into the black of night. On the cement steps, the children, adults, and volunteers gathered in anticipation of the 2018 New Year’s Celebration. Three fires blazed on one side of … Continue reading "Farewell! 2017"
Games have always been part of our Christmas tradition. Christmas Eve is sentimental whereas Christmas day is filled with fun and joy. We did not have groups of volunteers this time but the children were determined to have fun. The eldest children took the lead and collected sweets and coins for rewards. 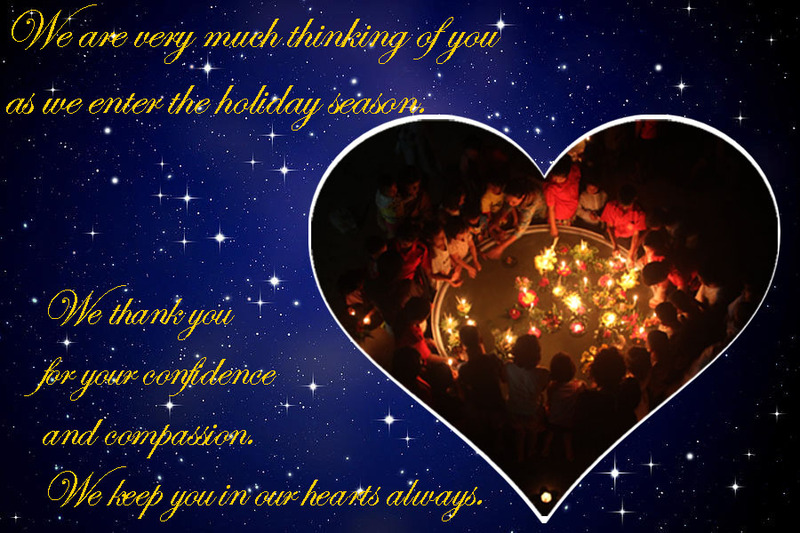 They designed all … Continue reading "Christmas games"
Every Christmas in Baan Unrak is special. We carefully promote the value of love, togetherness, and caring each year. This year the Baan Unrak’s manager gave full responsibility of planning the occasion to the children. Symbolically, Didi hung two bells in the kitchen entrance. The rest of the decorations were also the work of the … Continue reading "Mystical Christmas"
As we were nearing Christmas and New Years, many of our University students returned from school. They have been incredibly helpful in leading and facilitating events for their younger brothers and sisters. Lochoy was the first to arrive. He came back just in time as a valuable employee left for his own holiday vacation. Lochoy … Continue reading "Big children came back to help home at school holiday"
Two weeks ago suddenly someone called out at the Baan Unrak main gate. It was a man with a little bundle hanging across his shoulder. He had a brief conversation with our main staff and the bundle was turned over. Everybody’s curiosity was awakened, as everybody wanted to know what was in there. It looked … Continue reading "A new life came to Baan Unrak"
We are known in Sangkhlaburi as a children’s village. We are a tiny community within the confines of the city limits. As our own community we experience all the joy and the sorrow that naturally occurs in every social group. We enjoy the gift of life and mourn the sorrow of death like most. Since … Continue reading "The passing of Mya Win"
When people come to visit us they think that Baan Unrak is a very peaceful and beautiful place. They adore our loveable children. Nobody could imagine the struggle and sacrifice behind our serenity. We have a team of dedicated workers that sacrifice on a daily basis to make sure that every single child in Baan … Continue reading "Baan UnrakTeam"